Do you have Google Analytics and Google Search Console set up for your site? If not, install them as soon as you can. Tonnes of useful information. Like seeing that you’re getting traffic, but that visitors all leave your site in under 10 seconds. Or that none of your visitors are converting into calls, emails, or filled out forms. Chances are your website is not set up to convert visitors into enquiries. You’d think that just having a website would be enough. But in a time where most people have an average attention span only slightly longer than a goldfish, you need to stack as many cards in your favour as you can. And this is where conversion rate optimisation comes in. So here’s a walk through video introducing you to this concept, and showing you through two real examples (thanks for volunteering Tracey and Aleksandar!). It will show you how to make some quick changes to your website to convert more visitors into enquiries. Then it’s just up to you to turn them into customers or clients! Life is crazy busy and your time is valuable, so I don’t want to waste it. For that reason I added a kind of contents below the video with time stamps. That way you can watch the bits you’re interested in and skip everything else. On the youtube video, click on the little cog icon in the bottom right hand corner. In the pop up, choose “Speed”, then in the Speed options choose 1.5 times or 2 times faster. It’s kind of like speed reading for video. You’ll be surprised how good your retention of info is even at double speed (and no, it won’t make me sound like a chipmunk..)! 17.40 – Do you have extraneous information on your site that doesn’t lead to your main call-to-action? Robert from getsocked.com.au also volunteered his website for a walk-through. Robert is already doing many things right. So if you want to have a look at a site that is well optimised for conversions check him out! I also mention something in this video that I forgot to cover in the one above – the importance of having a single ‘action’ colour, so people know all the places on your site where you want them to or they can take action. These videos are part of a series explaining some fundamental digital marketing basics. If you want to do your own marketing (see if this is a good idea or not here) these videos will give you some solid ground to stand on. If you’re looking to outsource your marketing, then you’ll know enough not to have the wool pulled over your eyes. 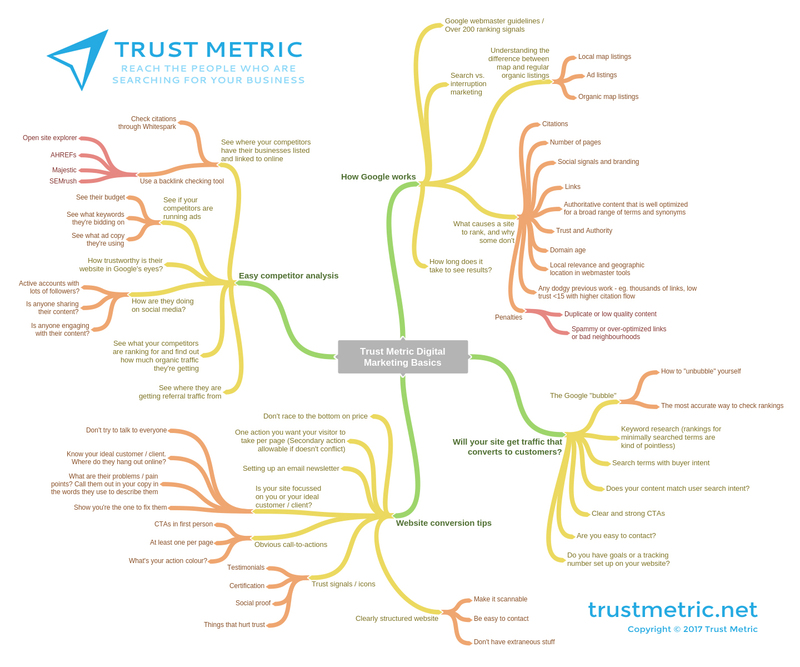 You can download a copy of the mindmap that lays out the Trust Metric Digital Marketing Basics video series if you’d like for future reference. Just click here to get it. If you’re already getting traffic but want to convert more of it into enquiries check out our services page. We have hourly consulting packages that are just right for your conversion rate optimisation needs. Or if you’re not yet getting the traffic or conversions you’d hoped your website would produce, find out how you can partner with us to grow your business here.